How Productivity Apps Could Help Salespeople? Selling is one tedious activity. It involves a lot of T.A.S.K.S – there is not one stressful day. Here comes the heaven-sent applications and programs that are specifically designed for the salespeople. If you are wondering how these productivity apps may help you as a salesperson, read on. First things first, though, please know that apps should be regarded as an enabler, your closest ally. A demo can be outwardly frustrating more so when you need to present and explain a complex product or solution. How can you ensure that you will deliver a critical differentiating value to your audience knowing that they are weighing several proposals? The solution is simple – a complete and interactive presentation through the help of an app. That is, through a digital presentation, you may visually communicate the features and benefits of such to any prospect in the clearest manner possible. The process is also more engaging as the sales representative can focus on guiding and listening to the concerns of the prospect. Not necessarily on whether he forgets a detail or two since all the details are being demonstrated in front of her. In the near future wherein new features are added to the product or solution, the salesperson may easily and seamlessly integrate these new changes into the system. Also, the app will send a notification to all the sales rep about the change or changes made to the sales presentation; that is if multiple people are utilizing the presentation. Following a meeting, a proposal should be drafted immediately including the requirements, specifications, and quotes. When there is a time gap between these two activities, it usually results to disconnected, draggy proposal. What’s worse, due to the lack of time to prepare the proposal, you send a copy-and-paste, templated sales proposal. Such disconnection is a huge turnoff to any prospect. And this prospect may feel like you are not listening to her, losing the opportunity altogether. Many a reason why this happens. First, the person who prepared the proposal was not actually a part of the meeting. Second, the salesperson failed to note essential details during the meeting. Third, the prospect requested modifications, but the sales assistant unintentionally overlooks such as the deadline is nearing. Lastly, the sales team is using a proposal template that hadn’t been evaluated since last year. Since the goal is to shorten the sales cycle, an app allows documenting important information without the need to take time away from talking to a prospect or detract from the presentation. A mock proposal can be devised on the spot. This also allows the salesperson to confirm the details with the prospect, potentially reviewing it before a final proposal is outlined. Afterward, the sales staff will only need to send or share the information with the proposal writer. The process is streamlined. Thus, you can send the proposal to the prospect even right after the meeting. Any sales personnel would understand the need to plan and schedule daily, weekly, monthly, and even quarterly activities diligently. It’s easy to get lost in the sea of things to do. Confusingly, a salesman or woman only spends 50% of his working time doing the selling. The other 50% is spent on answering emails, devising proposals, preparing presentations, attending meetings, researching prospects, and other administrative tasks. An internal meeting alone with the sales team can be awkward to organize with all the sales personnel outside the office. Coordinating the meeting only to postpone it for another suitable time incurs unnecessary costs, too. The same goes for making any adjustments to your calendar to accommodate prospect or client requests as well as keeping track of the critical dates. Effective time, task, lead, and client management are expected from all salespeople. Managing various information can be quite challenging, but the challenge can be minimized with the help of some tools. The best ones are those with reminder and notification features so you can better manage your and other people’s day and time. 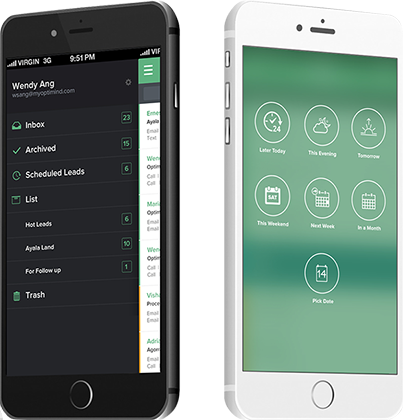 Thereby, productivity apps not only makes the sales process more streamlined and faster for the salespeople. Instead, your would-be clients mostly benefit from this situation, too. Their pain points of both the sales team and the prospects are addressed, minimizing pain points on the sales funnel, narrowing the gap in the sales cycle and eliminating whatever disconnect there is. All of these thanks to the utilization of apps that solve the problems the salespeople face and improve their overall productivity! There is no denying the value of using productivity apps. One such app is Vender App. Download it now and discover how can make the processes easier!